The valley in the extreme northwest of Italy is an independent region – by far the smallest in Italy, but also one of the most beautiful. The valley is surrounded by the highest mountains in Europe. To the west the Mont Blanc, to the north the Matterhorn and the Monterosa group, to the south the Gran Paradiso massif. While the largest glaciers in Europe lie at the top, wine and palm trees grow at the bottom. The large and the small St.-Bernhard-Pass have been opening up the valley for many centuries. Numerous customs castles and mountain fortresses have been preserved along the medieval trade routes. 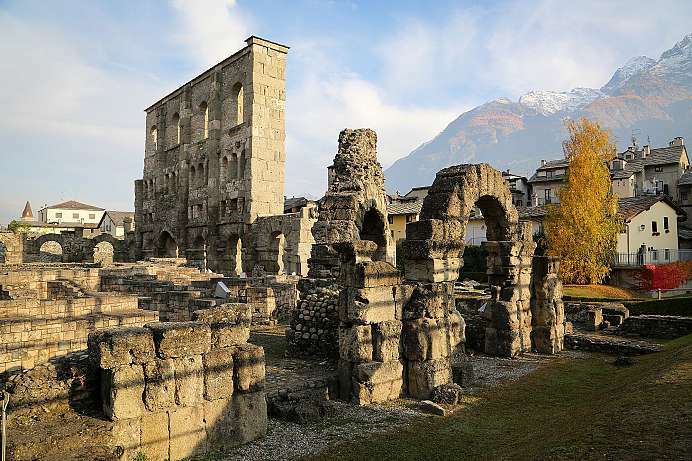 The main town in the Aosta Valley was already a flourishing town in Roman times because of its strategic position between the Small and Great St. Bernard Passes. The city wall, the stones of which are found in medieval buildings, but also a triumphal arch, and two bridges from the time of Emperor Augustus bear witness to this. From the 11th century Aosta belonged to the Duchy of Savoy. The cathedral dates from this period, although it did not receive its present form until later. 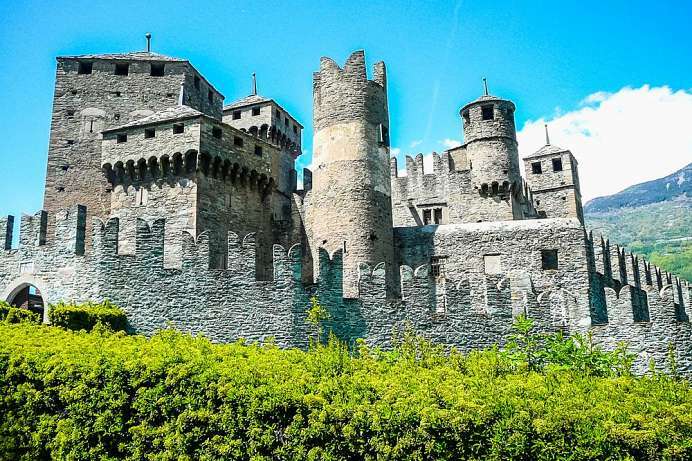 At the beginning of the 19th century Aosta came to France and a good 50 years later to Italy. Until today the population is bilingual. The mighty castle does not lie on a cliff, but only on a hill. Apparently it did not serve as a defense, but was from the outset the prestigious residence of the Challant family. Since the 14th century, a magnificent courtyard has been built around the keep, decorated with murals depicting Saint George as a dragon slayer and a group of wise men and prophets.